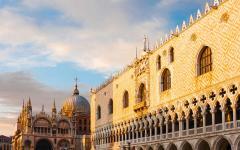 Lose yourself in luxury, history and romance as you effortlessly drift through Italy and Greece on this three-week tour. Beginning in the Venetian canals, we lead you through the hearts of opulence in Lake Como and the Italian Riviera before you find yourself at peace on the whitewashed island of Santorini in the Aegean Sea. Complemented by authentic Tuscan feasts and quiet seaside Italian towns, this three-week tour will reveal all that is magical, timeless and positively cherished in these two quintessential European countries. Blissful, passionate, and utterly comprehensive, this three-week itinerary shares with you every ounce of romance, opulence and adventure that Italy and Greece have to offer. 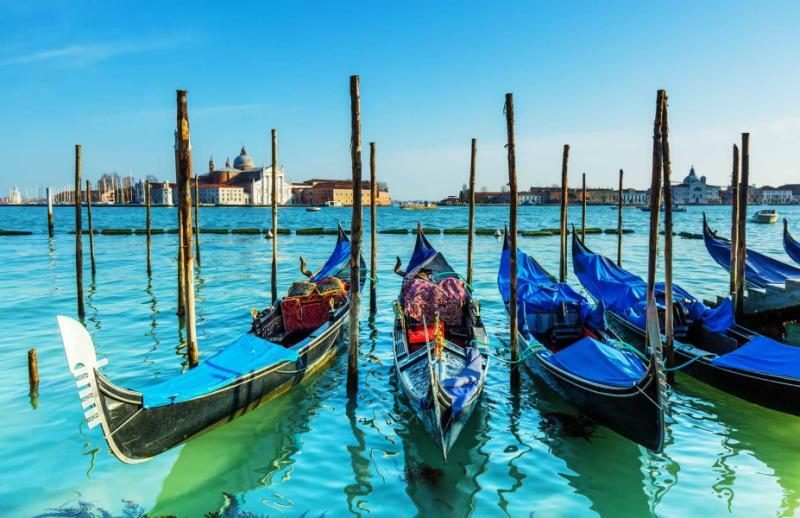 From the canals of Venice through to the shores of Santorini, and every vineyard, restaurant, gallery and alleyway that lies between, you will not only visit – but also experience – the most coveted sights in the region. Traveling between luxury accommodation by rail, ferry and plane, there are few opportunities more decadent than this. Beginning in Venice, Italy first captures your imagination with her Venetian masks, island-based glass blowers and delicate lace shops. 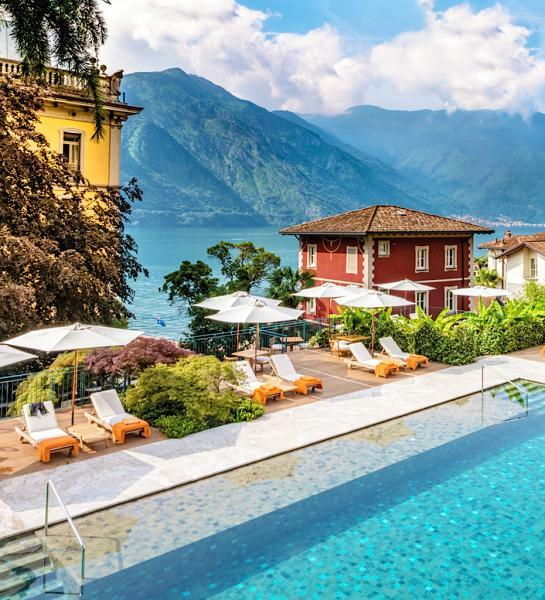 After strolling the alleyways and drifting on gondolas, you then move onto the utterly exclusive shores of Lake Como and the Italian Riviera, where luxury and charm intersect beneath the mountains. 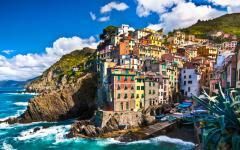 From there, you travel through the ever-charming villages of Cinque Terre, moving on to the rolling hills of Tuscany. Vineyards, the Renaissance and a stream of Tuscan flavors will characterize your remaining days in Italy, before you eventually travel onwards to Greece by way of Rome. 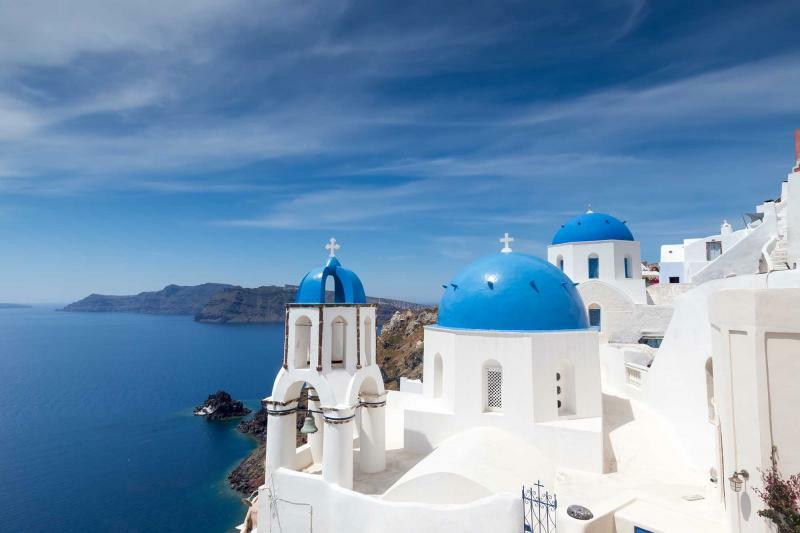 Your adventure concludes with a full week on the whitewashed island of Santorini. Adored for her simple elegance and timeless character, a visit here requires little more than drifting between sunsets with ouzo in hand. Days are filled just as much as you desire – with many opting to slip into lagoons, wander beneath windmills and savor the fresh flavors emerging out of taverns. Innumerable beaches, each more unique and stunning than the next, are sure to entice you in the late afternoon. Here, you can wait for sunset to turn a whitewashed lighthouse a dusty shade of pink, before you reviews eventually return back to reality – just a little more enchanted. 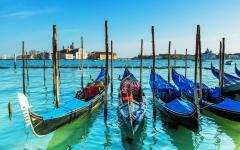 For more itinerary options, browse the Italy tours and Greece tours on Zicasso. Touching down in Venice, not a moment of romance or adventure is wasted. 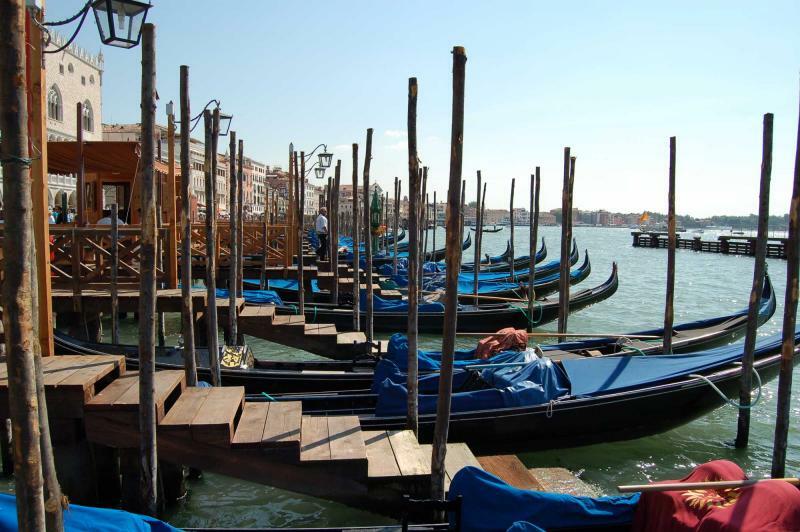 Upon arrival, you will connect with a water taxi that will transfer you through these infamous canals, arriving eventually at your luxury hotel. Perched on the edge of the Riva delgi Schiavoni – mere steps away from St Mark’s Square and the Doge Palace, the white Istria stone façade of the hotel shimmers in the lagoon below. The hotel has retained the original Biedermeir furnishings inside, which creates an elegant and relaxed atmosphere that feels almost untouched by time. As you enter your unique suite, you will catch your first soaring view of this effervescent city, building excitement for all that lies ahead. 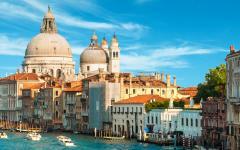 Devote today to leisurely exploring the canals, street cafes, boutiques and galleries that stipple this historic city. 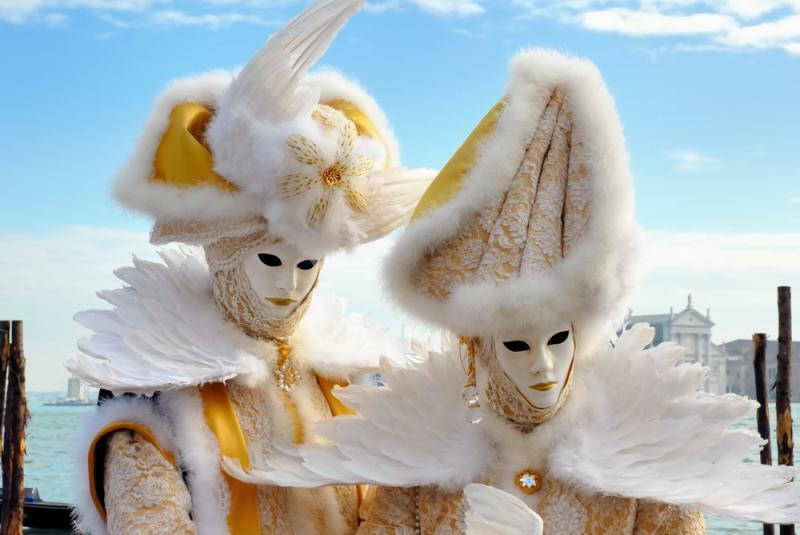 Explore the immense talent that radiates from Venice as you examine blown glass, fine Italian art and of course, the Venetian masks. Continue your wandering well into the evening, as stars emerge above. 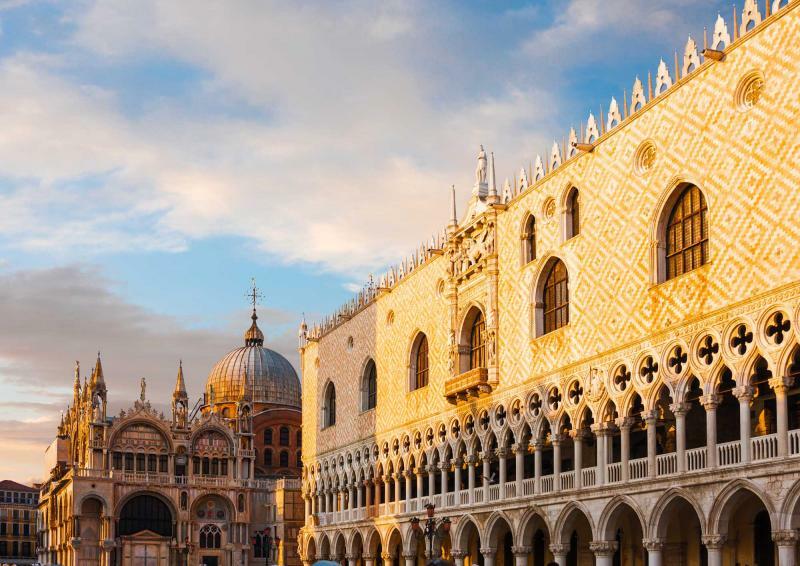 Seek out the perfect candlelit table in the Piazza San Marco and allow yourself to be swept away as a violinist plays to your table while you indulge in a classically Venetian feast. Completely this impossibly romantic evening with a moonlit gondola trip, and then retire – with a full heart – to your luxurious suite. 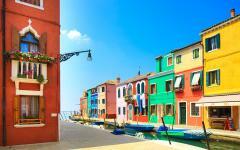 Set out today on a guided half-day tour of Murano, Burano and Torcello – the three islands located in the Venice lagoon. 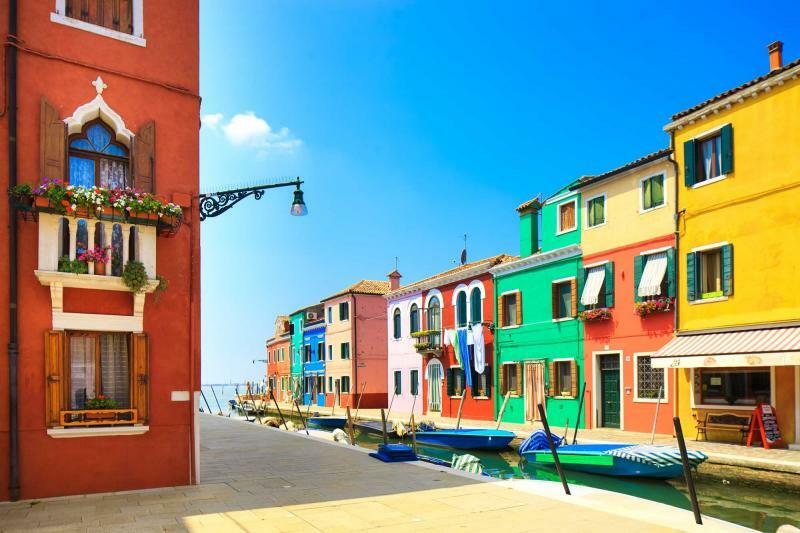 Each island has its own distinct culture – from the glass blowers of Murano to the countless and ever-delicate lace shops of Burano. Gliding between islands in a motorboat, you’ll also come to appreciate the distinct and colorful architecture that characterizes these European fishing islands. The tour will then conclude on the ancient island of Torcello, where you can visit some of the oldest Venetian churches, including the cathedral of Santa Maria Assunta and the remains of the circular baptistery in Santa Fosca. 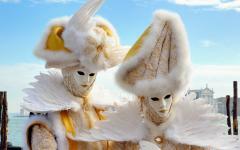 Today’s unique fusion of craft and culture will leave you even more enthralled with the elegance of Italy. Traveling as Italians do, you will board a train traveling from Venice to Milan before connecting onwards to Como. 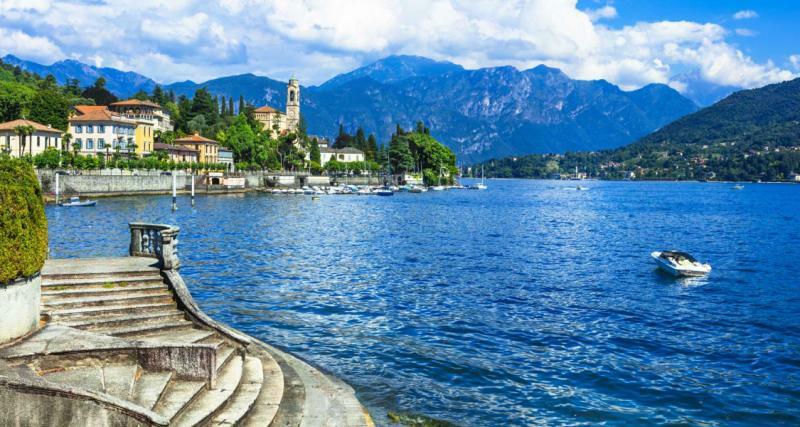 There, you will board a ferry that will whisk you across the lake to the exclusive and utterly picturesque town of Bellagio. You will stay here for the following three nights. Your corner suite will look out through French doors onto the lake, but the hotel itself is located in the heart of the old town. You may choose to spend the remainder of the day exploring the wisteria-woven terrace or relax in the 18th century lounge. 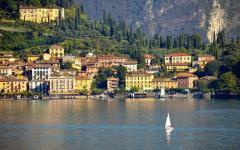 With gourmet restaurants and endless Italian wine around you, allow yourself to drift away into the rhythm of Lake Como. 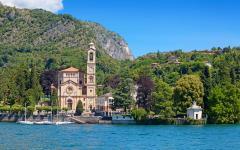 Spend today entirely at your leisure as you wander the dramatic and romantic shoreline of Italy’s most coveted lake. Follow winding cobblestone roads to the pastel waterfront and explore the shops and 18th century hotels. Indulge in delicacies, pamper yourself at the spa or simply find a quiet corner to absorb the magic of it all. Today is yours to design. 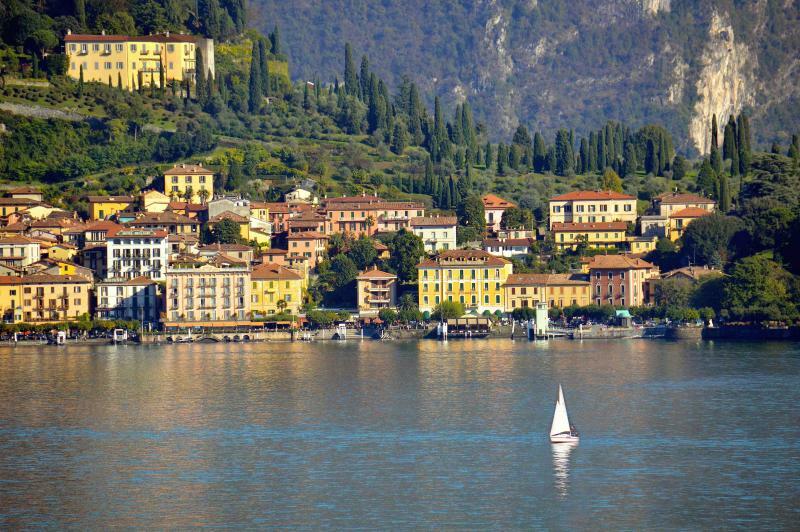 Consider spending a portion of today exploring beyond Bellagio, stepping out by ferry to wander through historic villas surrounded by azaleas and rhododendrons. 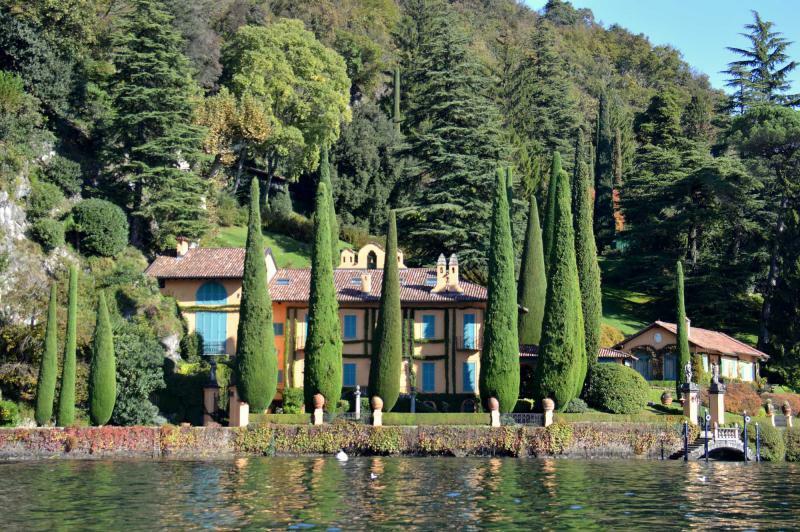 Strolling the lakefront, be sure to seek out Villa Melzi – a neoclassical villa surrounded by immaculate gardens filled with exotic trees. 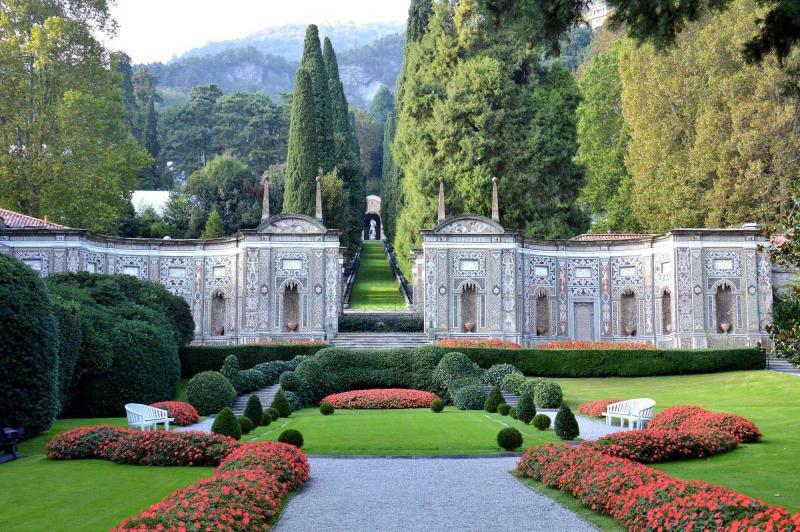 Tremezzo too is worth a wander, if not only to see Villa Carlotta’s fine art collection and the surrounding fountain-filled terraced gardens. Allow yourself to be swept away by a Canova sculpture before returning to your private paradise at your hotel. 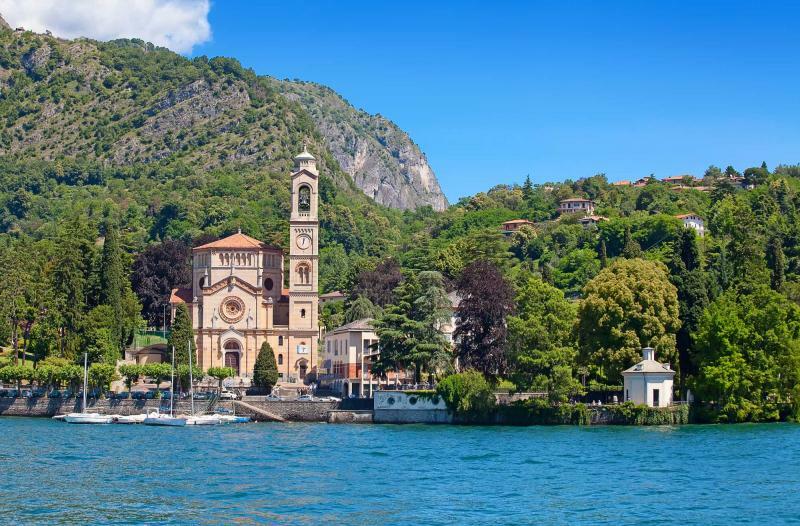 Following a final blissful breakfast in Bellagio, you will board a ferry and then travel by train through Milan, arriving in Genova for lunch. 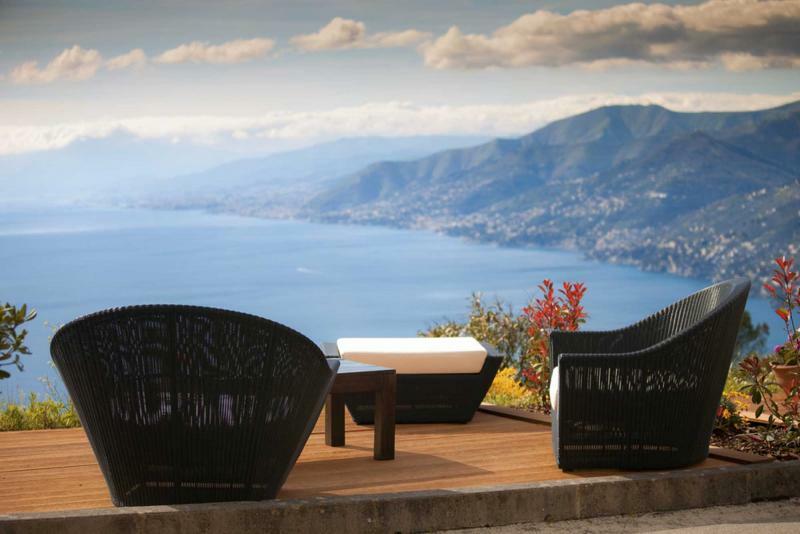 Here, in the Italian Riviera, you will stay in Portofino at an exclusive hotel nestled between the Ligurian Sea and the Maritime Alps in a serenely lush landscape. This warm and friendly hotel retains the feel of a classic Italian villa, with its colorful gardens and its intimate surroundings. Located only a few steps from a private beach, you will find yourself consumed with yet another variation of Italian adventure and romance. 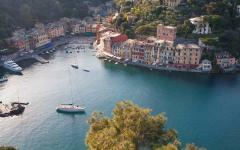 Since the mid-twentieth century, Portofino has been a darling of elite travelers. This once quaint fishing town has been transformed into an elegant fusion of luxury and local culture. Along with stunning ocean-views and dramatic cliffs, you will find a myriad of seafood-based culinary delights to satisfy your palate. Shopping, too, is a blissful way to pass the time, and watersports are prevalent for those who crave some adrenaline. 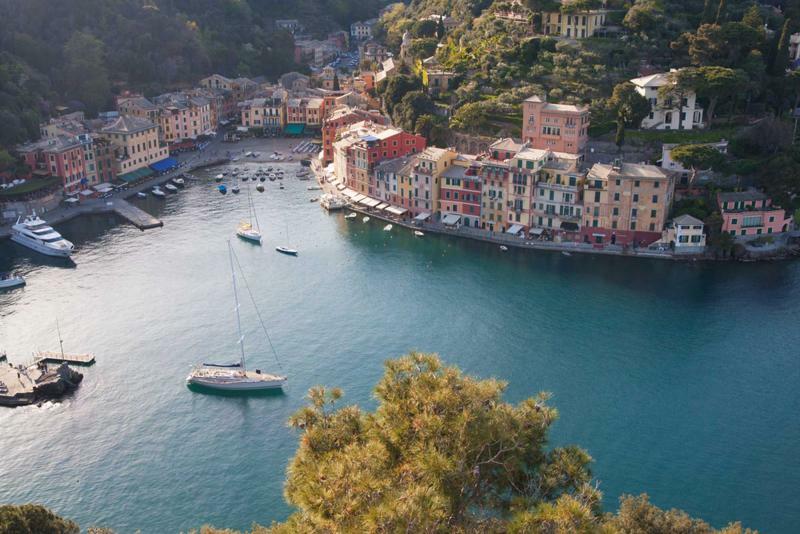 Boarding a sea taxi in the morning, you will travel from Portofino to Cinque Terre, a collection of five breathtaking seaside towns, built into the edge of the mountain. Fringed by ocean and olive trees, you will have the opportunity to explore the surroundings by train or by foot as you become acquainted with the unique and colorful features of Vernazza, Portovenere, Monterosso, Riomaggiore and Manarola. Individuals will find their own connection with each of the unique towns. 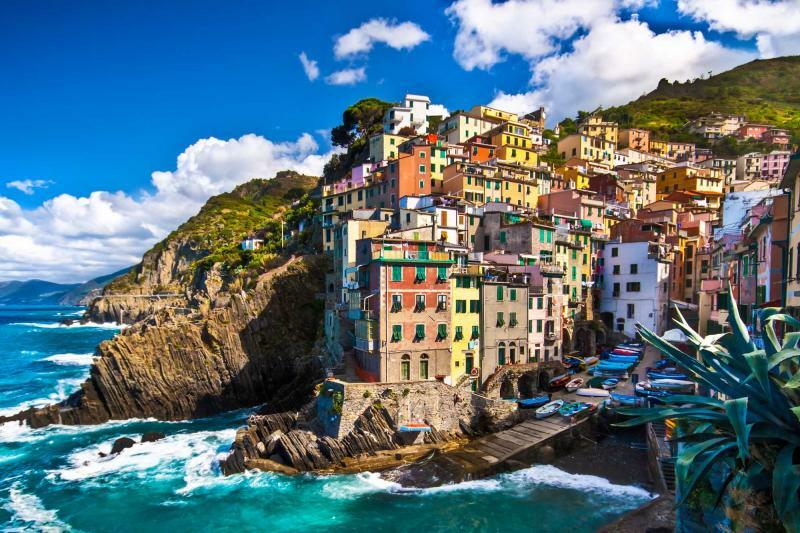 Highlights for many include the ancient Doria Castle in Vernazza, the sand beach in Monterosso, the harbor of Manarola, the whales and dolphins off Riomaggiore and the history of Portovenere, a UNESCO World Heritage Site. Spend the day sampling olives, sipping wine, savoring pesto and slipping in and out of the ocean as you soak in the indescribable beauty around you. Your visit here is sure to win a special place in your heart. Leaving Cinque Terre by train, you will find yourself surrounded by rolling hills, fields of sunflowers and tiny stone villages that characterize Tuscany. 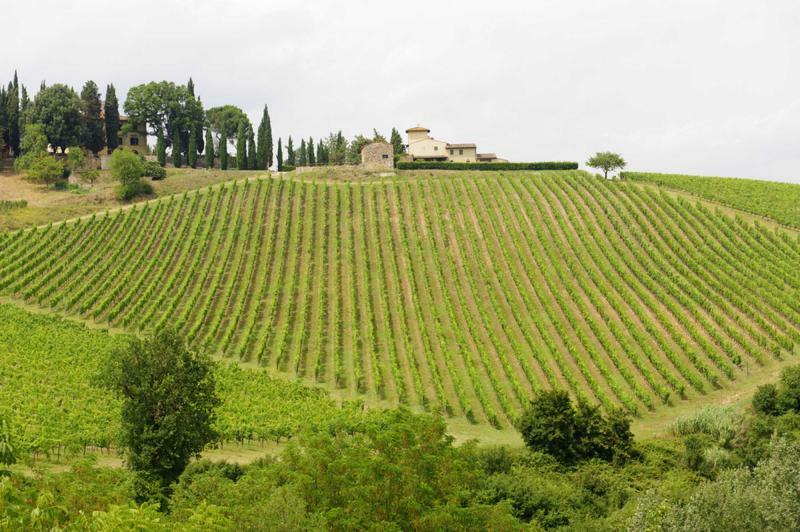 A car will drive you from Florence to your villa – the former home of the Montepulciano family. 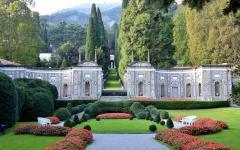 Built in the late 16th century, the villa retains much of its historical charm. Wooden capitals, ancient doorposts and a fluid blend of the exterior and interior through soft colors and open air ensure that this villa fulfills all of your Tuscan fantasies. Consider strolling up the hill from the villa to the settlement of Montepulciano, where you can sample some of the country’s finest wines. The Val d’Orcia region is believed to be one of the great inspirations for Italian Renaissance artists. Landscapes here are easily mistaken for pieces of art – and the ancient towns of Sienna, San Gimignano, San Ouiro d’Orica and Montalcino are no less whimsical. Spend the day ascending and descending through hills and valleys as you trade sweeping views for intimate moments. Pause for espresso and gelato in Sienna’s Piazza del Campo before making a final ascent to Torre Del Mangio for an all-encompassing view of the terracotta walled city. 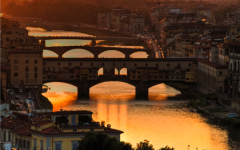 Returning to Florence by road after one final breakfast of fresh and local Tuscan delicacies, you will spend today fully immersed in the majesty of Florence. This city has had a long standing reputation for being one of the most artistically influential regions on the planet – and today, you will stand in the heart of it all. Walk between delicate statues and countless fountains, as you find your way towards the Duomo and the Uffizi Corridor. Wander past Dante’s House and the Piazza Signoria, before arriving at the jewelry-filled Ponte Vecchio. 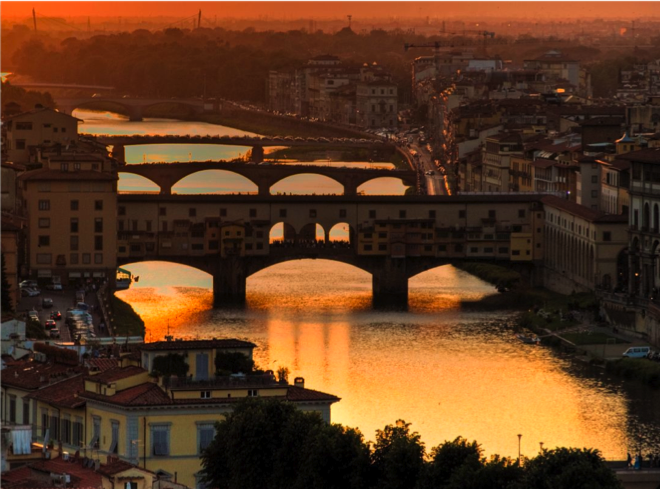 Splurge on some gold – or take delight in gelato, before wandering to Piazzale Michelangelo with a bottle of wine for the city’s best sunset. Your final days in Italy will be yours to design. Whether you wander the narrow passageways or immerse yourself in Renaissance art, you will have the option of a late afternoon wine tasting at Castello Banfi before dinner at this estate. In addition to tasting sensational wine, you will also want to sample some of the country’s most delicious olive oil and balsamic vinegar. Paired with estate wines, your five-course Tuscan menu will surely be the perfect farewell meal from Italy. 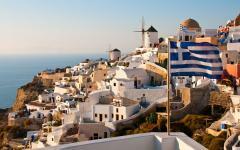 This morning, following a final Italian breakfast, you will drive to Rome for your direct flight to Santorini, Greece. 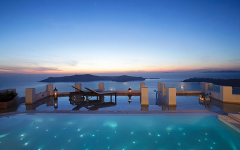 Landing on this coveted and quintessential island in the Aegean Sea, you will drive to your hotel where you will stay for the following six nights. 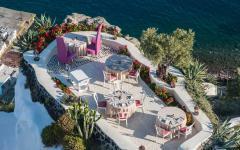 This hotel – perhaps better described as a sanctuary – is located high on the cliffs. The flawless blend of Santorini blends with sophisticated luxury to create a romantic and timeless environment. Spend the afternoon alternating between swimming and sunbathing – and do not forget to return to your private terrace for some before-bed stargazing. 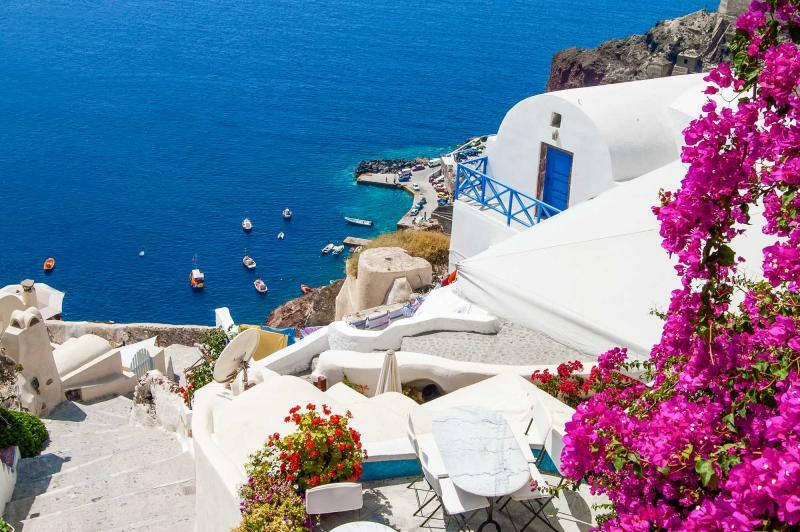 Bliss hardly begins to describe the all-consuming feeling you have when visiting Santorini. 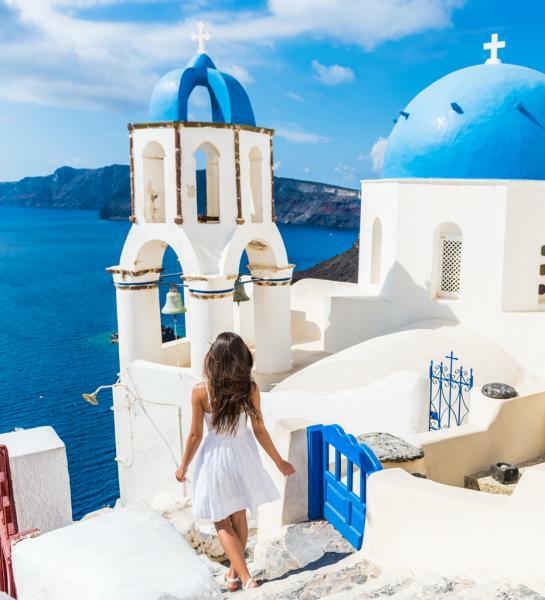 Whitewashed buildings and blue-domed churches perched on cliffs over the sea are just as captivating as images might suggest. For the following six days, you will be the architect for your Greek adventures. We can suggest favorite activities and it will be left to you to combine them to create your perfect blend of relaxation, exploration and of course – indulgence. You may want to start the day by familiarizing yourself with your surroundings. Strolling the shoreline is perhaps the best mode of exploration, since you can follow it to the neighboring towns of Fira and Oia. However, if you would rather stay close to home, you may be completely captivated by the tiny town of Imerovigli in which your hotel is based. With a few taverns and stores, you can easily slip into the local rhythm of the island before returning to your suite for a private starlit dinner on your terrace. Terrestrial and aquatic beauty competes in Santorini for your undivided attention. Having explored villages and winding shorelines yesterday, dip down today towards the sea. Follow the curves of the shoreline as it alternates from rock to sand, encircling a giant lagoon. Take note of signs of volcanic activity that hide themselves in the pebbles, and bubble out of the hot springs. 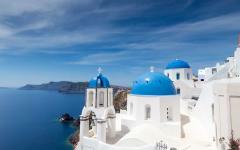 Eventually, wander up to the island’s capital, Fira, for stunning views of the lagoon below, and the town all around. Indulge in classic Greek cuisine as you sample local and regional delicacies. The longest single stretch of beach on Santorini is found where Perissa, Perivolos and Agios Georgios Beaches combine. Sandy sea bottoms, with the occasional pebble or submerged rock, make this a sensational spot to suntan and swim. After securing a sunbed, wander the shoreline in search of the perfect tavern or café to seek refuge in during the midday sun. Or, for those that are aquatically inclined, consider seeking out a dive center to explore the magical underwater Mediterranean landscapes. Dive or snorkel amidst octopus, eels and volcanic topography before surfacing for dinner by the sea. Your time in Santorini may feel incomplete until you visit Akrotiri Caldera Beach. Famed for its lighthouse and cliff-side homes, this town is as delicate as she is powerful. Stroll up and down the staircases that weave between homes and hotels, taverns and cafes. Shopping and snacking as you go, you may eventually find yourself descending from town to the volcanic beach below. Quiet and contemplative, here you will find incredible views of the volcano, the village and the surrounding red cliffs. Alternatively, consider walking to Aspri Paralia – the white pebbled beach – or Mesa Pigadia, where you can find a number of caves that jet out over impossibly clear water. No matter where you spend the day, return to the town for an evening cocktail at any one of the taverns that overlooks the ocean and the soon-to-be-spectacular sunset. As this amazing and relaxing tour of Italy and Greece draws to a close, you will have one final day of romance and adventure. One of many excellent ways to conclude your trip is to rent a car, permitting you to drive freely around the island. Consider heading to the northeast coast in search of solitude, eventually working your way to Koloumbo Beach after passing through Oia. Here, visitors are treated to tranquility as they escape the crowds and development. Allow yourself to disappear as you listen to the waves rhythmically roll up on shore, reflecting on this spectacular journey. Complete the experience with one final candlelit meal on your private terrace – complete with stargazing and local delicacies – before retiring, one final time. This morning, after what is sure to have been a truly sensational three weeks, you will begin your journey home. Following one final Greek breakfast looking out over the edge of Santorini, you will return to the airport. Your flight will take you through Athens, ultimately connecting on to your final destination. 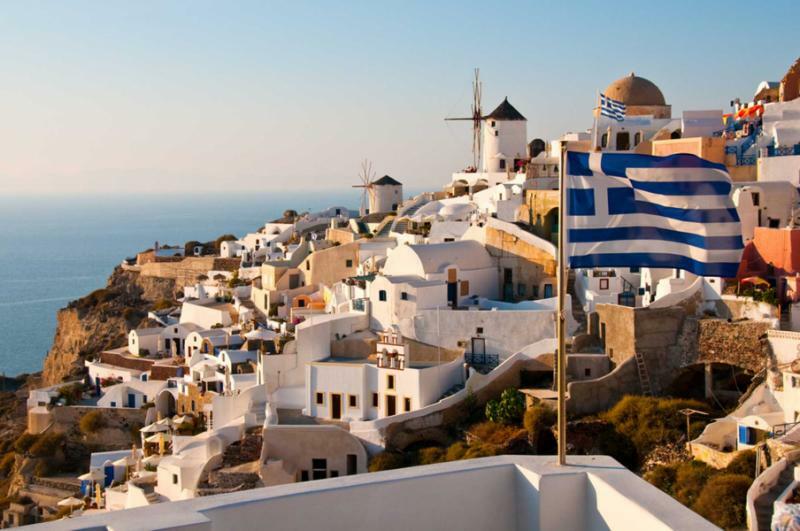 You may want to browse Greece travel reviews or the Italy travel agency section to read about traveler's customized experiences. "It was like having a personal travel agent who personalized the trip just for me. Loved it!!" "Our agent and her company did an amazing job and we will not hesitate to use her again." 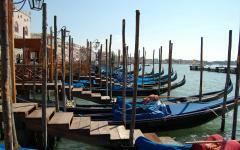 "Our travel agency was very helpful in setting up a full itinerary beforehand..."